The main featured image above shows St Edmund’s from the north west. The lean-to extension, for use as a kitchen, was built in 1983. 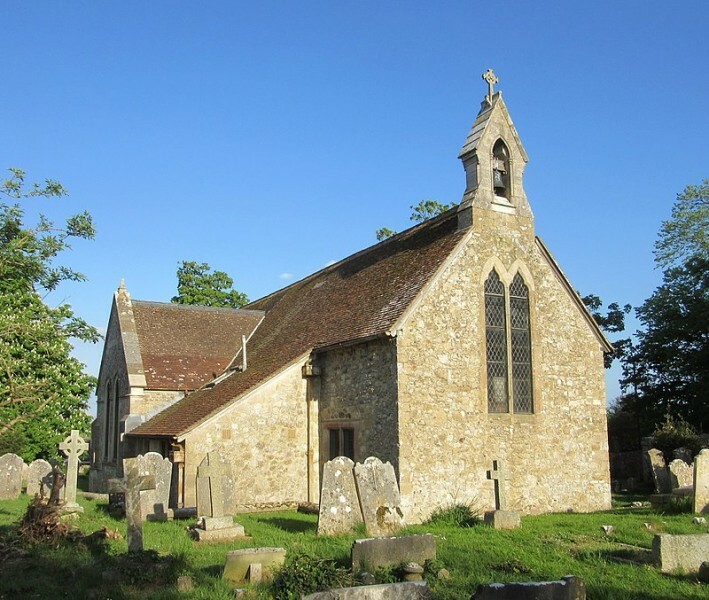 The gabled north chapel was a rebuild in 1892 of the chantry chapel originally built at the end of the 12th century and dedicated to St Edmund the King. 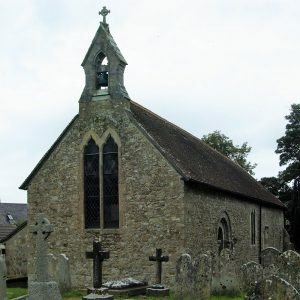 The chantry chapel and the chancel were extended eastwards in the 13th century, at which time the four Early English lancet windows were inserted in the chancel. The bell turret and single bell seen in the photograph were installed in 1893. St Edmund’s was built on the site of a previous Saxon church, but was not recorded in the Domesday Survey of 1086. 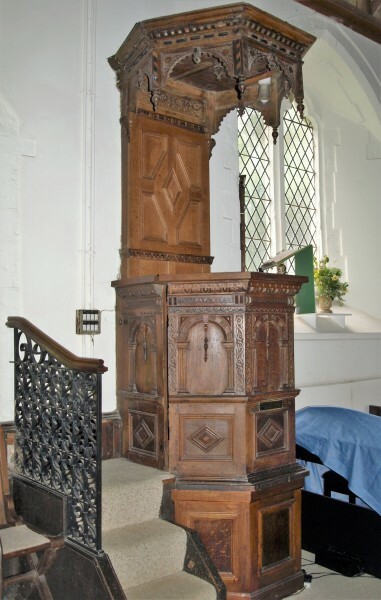 One source dates the building to 1087, and another to the early 12th century. 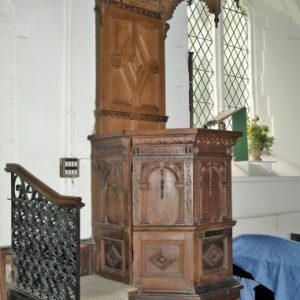 Both could feasibly be correct as there is a noticeable change in the masonry work between the nave and the chancel, maybe suggesting that a chapel consisting of nave only, and dating to 1087, was added to early in the following century. 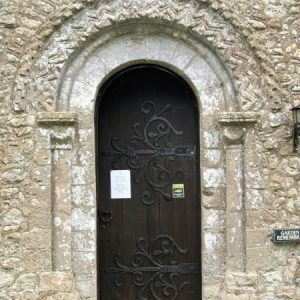 The first photograph in the gallery below shows the fine Norman south doorway with chevron and billet mouldings to the semi-circular arch. 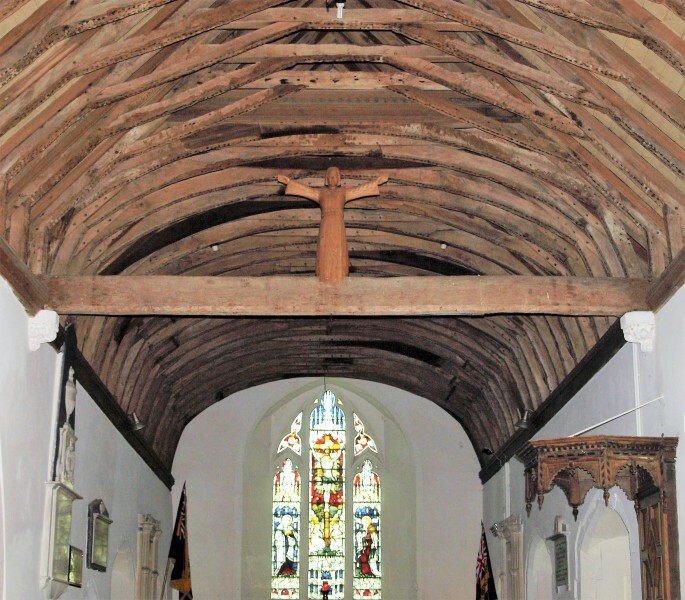 The second photograph shows the common rafter nave roof, the chancel barrel roof, and the rood beam with carved wooden figure of Christ. 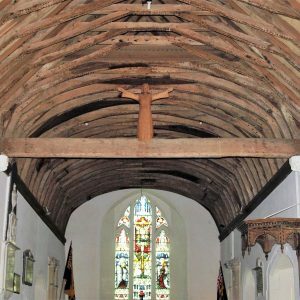 Above this is an odd marked truss which was probably part of the rood loft, pre-reformation. 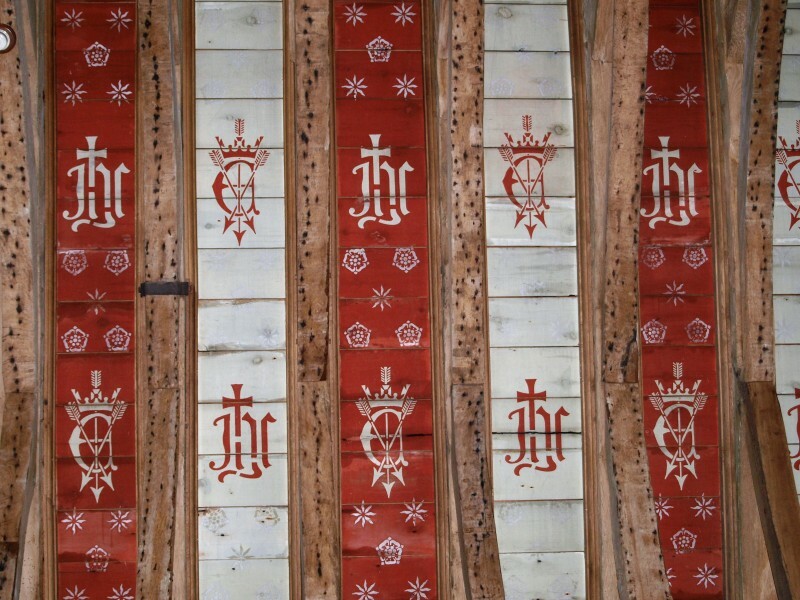 Next is a photograph of the chancel roof, which was decorated in the early 20th century. 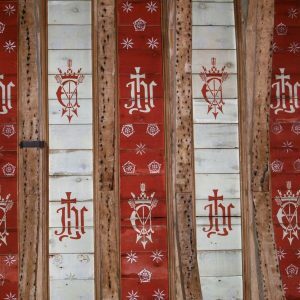 The symbols are alternately those for Jesus (JHC monogram) and St Edmund (E for Edmund with arrows piercing a crown signifying the gruesome manner of his martyrdom in 870 AD when he was apparently tied to a tree and shot with arrows before being beheaded). 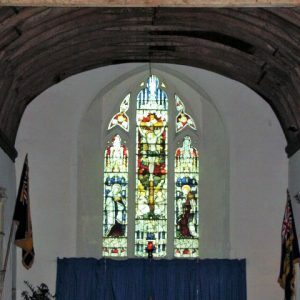 The fourth photograph in the gallery shows the 14th century east window. 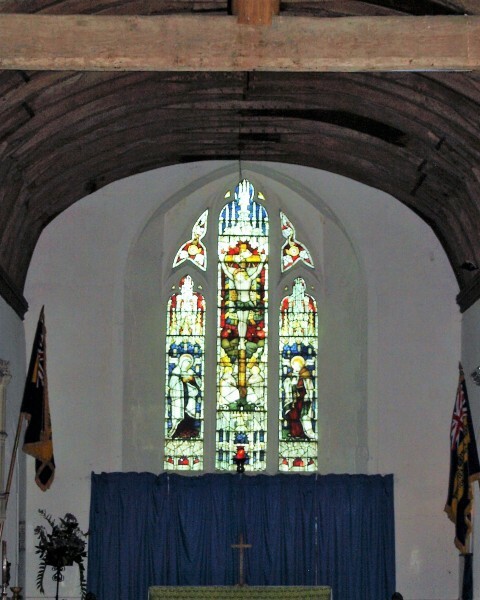 The stained glass depicts the Crucifixion with Christ on the cross in the centre light, and the Virgin Mary and St John in the side lights. 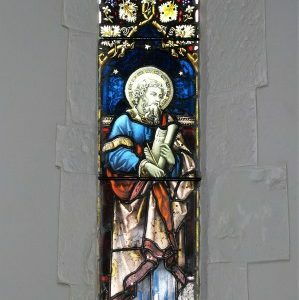 Next shown is one of the four 13th century lancet windows in the chancel, this one with stained glass depicting St Luke. 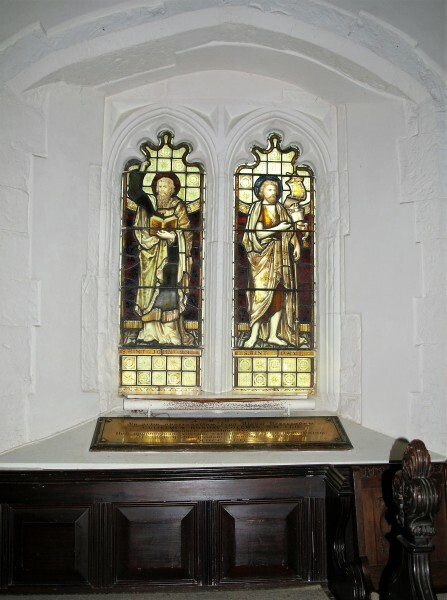 The sixth photograph in the gallery is of another stained glass window. 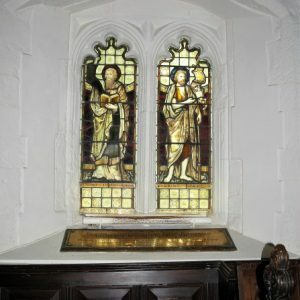 This one is a two light 14th century window with cusped cinquefoil heads, and with glass depicting St John and St Paul. 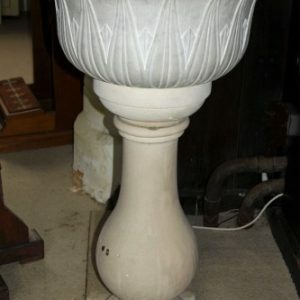 The next two pictures are of the carved pulpit and tester, and the circular carved stone font. 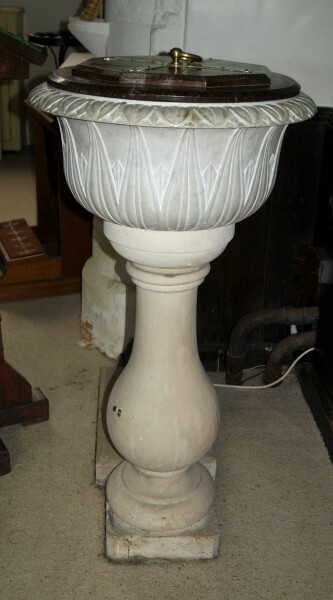 Both date to the Jacobean era (early 17th century), although the font stands on a Victorian baluster stem base. 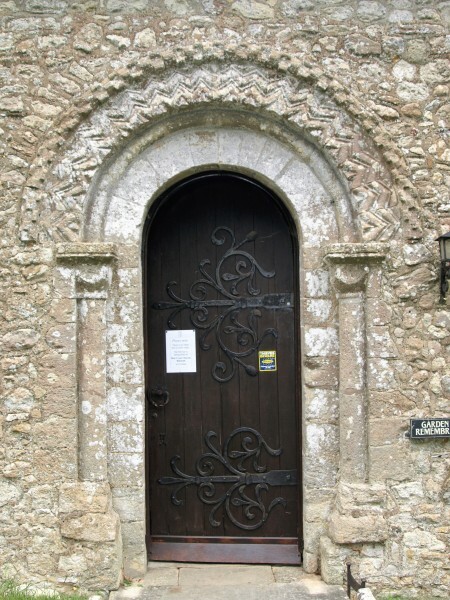 Finally shown is another external photograph of St Edmunds, this one from the south-west.